Stained glass windows are beautiful creations found in our churches. 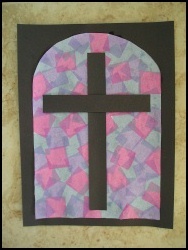 Children will love to make thier own stained glass window! 1. Cut 1/2" off from around you white paper, and trim off the upper corners (you need to trim the paper so that the 'window' will be small enough to be 'framed' in the black paper). 2. Cut your tissue paper into squares (around 1"x1"). Now you will need to water down your glue by mixing about 1 teaspoon of glue and 1 tablespoon of water. It should be very watery. 3. Now you can begin to put the 'stained glass' onto your 'window' by brushing the watery glue onto the paper, sticking on a piece of tissue paper and then brushing over top with more glue. Continue until the window is covered. 4. Once the glue is dry (it will dry fast because the glue is so 'thin') trim off any excess tissue paper from around the window. Glue the window on to the black construction paper. Use regular glue not the watery glue to put the window in the frame. 5. Now it's time to build the cross for the window. Cut 2 strips of black paper about 1" thick, cut to make a cross. Glue onto your window.